What in the heck is going on at the multiplex these days? Last weekend was the worst in some three years and the hunk of utter garbage 'New Year's Eve' aside, it's not for a lack of quality product. But no fears, RDJ & Tom Cruise are here to save the day. 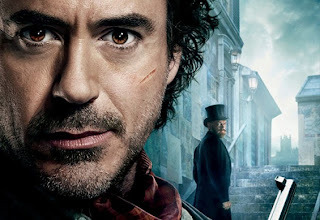 Sherlock Holmes: A Game of Shadows ($42M) - While the first 'Holmes' movie was one of the most overdirected and overproduced flicks I've ever endured, the thing raked in $62M its opening weekend and racked up $209M overall. The reason for the downgrade in cash this go around? The first SH opened on Christmas weekend which equates to a captive audience with few other options - this is the busiest shopping weekend of the year. Alvin and the Chipmunks: Chipwrecked ($27M) - Here's a sobering thought, the first two Alvin movies have amassed some $440M combined - that said, my besmirching of Jason Lee's name will continue undaunted. Mission: Impossible - Ghost Protocol: The IMAX Experience ($14M) - Bizarre opening for the fourth MI film - hits 300 IMAX screens this weekend ahead of the full release next Wednesday. Given the hefty IMAX ticket price - Cruise should cruise to a hefty haul. Arthur Christmas ($10M) - At some point this Christmas movie will gain traction - probably when it hits DVD next Christmas. New Year's Eve ($8M) - Thank you America for restoring my faith in mankind and ignoring this blatant cash grab - the thing tanked in spectacular fashion proving that Ashton Kutcher is akin to arsenic these days. The Muppets ($7M) - If you haven't seen Kermit and crew yet, get on this nostalgic gem - it's brilliant. Young Adult ($6M) - Charlize Theron proving she is one of the most talented actresses in the game but the movie itself is disappointing considering the track record of the man behind the camera.